Hei, oikein mukavaa sunnuntaipäivää! Tervetuloa helmikuun Penny Black and More haasteen pariin. Kohti ystävänpäivää teemalla: "Rakkaus, sydämet ja kukkaset". "Love hearts and flowers"! Remember that the focus of your card is a real stamp! 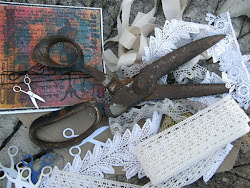 Our sponsors are Penny Black, Craft U Love, Little Claire Designs. wooden diecut (For my Friend) coloured with DI and embossed clear. Jättämällä kommentin osallistut yllätysten arvontaan aina syyskuulle asti. Hellunen neitokainen ja sydämellinen kortti! Mukavaa sunnuntaita! Such a amazing card Mervi! 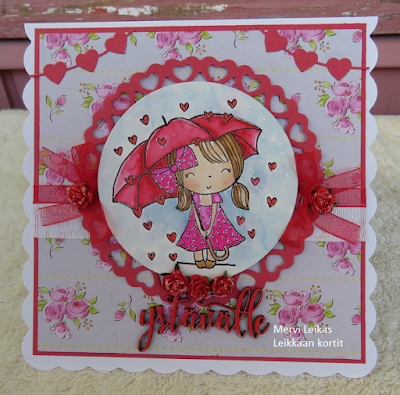 Your card is just adorable Mervi, loving all the pretty pinks making for such a feminine creation. What a cutie Mervi, such a sweet card !! One of my favorite Mimi images, this is so cute! And loving those heart strings on the two corners. I just ordered it, but it hasn't arrived yet! oh, this is so sweet, mervi! mimi is adorable and the background paper is gorgeous! It's adorable! Image, colors, decorations, everything! I have a few PB stamps, but not many, I see you use many I haven't seen in shops here yet. This is perfect for Valentine's or a girl's birthday. Oh what a beautiful and adorable Penny Black card. Such a sweet image and I love the way you used it, your layout is fab.